The big news this week is the opening this evening of Opera Atelier's Coronation of Poppea. 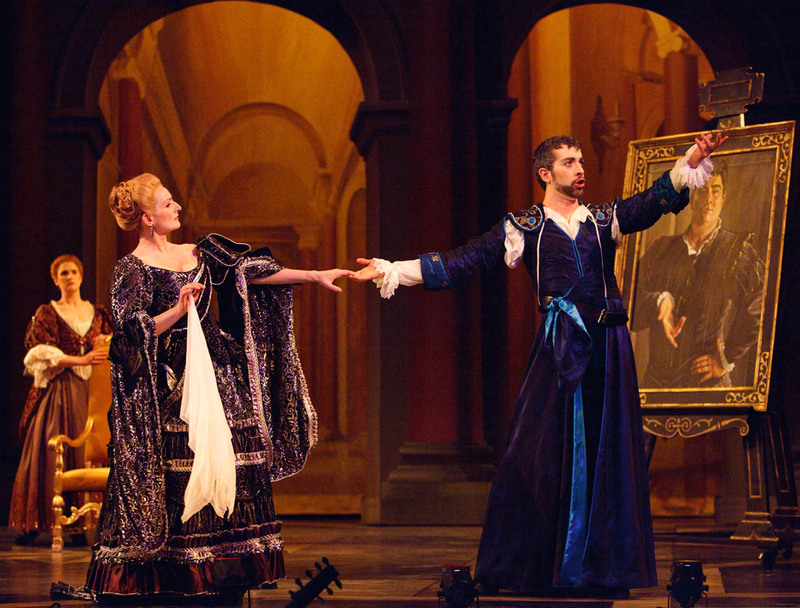 It stars the sensational male soprano Michael Maniaci as Nero, and Peggy Kriha Dye as Poppea. Both are familiar to Toronto audiences in their previous appearances. 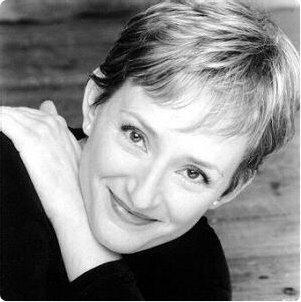 New to OA is the long overdue debut of Canadian mezzo Kimberly Barber. 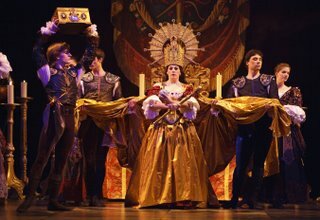 To me, Barber's most memorable performance in Toronto was Handel's Xerxes for the COC, now almost 10 years ago. Barber has since taken up a voice professorship at Wilfrid Laurier University, while continuing to maintain a performing career. A few months ago, I had a nice phone conversation with her when I was writing a piece on the OA Coronation. I was curious how she manages to combine a singing career with a teaching position. "When WLU interviewed me, they asked how I would be able to balance my life" Barber says. "I'm already balancing home life, child care, attention I give to my partner, and a physically and emotionally demanding career. (Teaching) means I'll just add one more thing in my life to balance!" Barber also finds that teaching and singing complement each other - "(Singing means) I have a lot to give back to my students...likewise I draw energy from my students. It keeps me fresh and my mind open. I am always grateful for a few weeks when I was singing Regina - it is all about me (laughs). When you come back afterwards and full of the wonderful ego stroke, you come crashing down to reality - my students say - 'that was great, now help me'... it keeps things in perspective!" 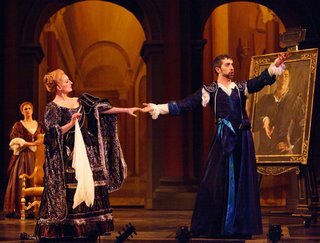 The show also stars Michael Maniaci (Nero), Peggy Kriha Dye (Poppea), Joao Fernandes (Seneca), Olivier Laquerre (Ottone), and Laura Pudwell (Arnalta). David Fallis conducts the Tafelmusik Baroque Orchestra. Dates: April 25, 26, 28, 29, May 1, 2. All shows at the Elgin Theatre. Another interesting event this week is the appearance of Vladimir Spivakov and the 120-player National Philharmonic of Russia, at Roy Thomson Hall, on Tuesday, April 28, 8 p.m. This is the orchestra's Canadian debut. The guest soloist is pianist Denis Matsuev, who will play the ever-popular Rachmaninoff piano concerto No. 1. Also on the program is Prokofiev Four Pieces from Romeo and Juliet, and Anatoly Liadov The enchanted Lake, Op. 62. Matsuev is the winner of the Tchaikovsky Competition in 1998, and has concertized widely in all the top venues, including appearances at Carnegie Hall, Theatre de Champs Elysees, Salzburg Mozarteum, Muskverein in Vienna, and Roy Festival Hall in London. This will be also be his Canadian debut. Formerly director of Vienna’s famed Bergtheater, Bachler was aware of stage director Barbara Frey’s work and his engagement of her to stage Jenufa, her first opera, was a gamble that paid off. She took the story of lost love and infanticide to heart and her taut reading makes the story both a searing drama and an epic tragedy. The setting, an open house on stakes, served to focus attention on the tension of this dangerously dysfunctional family drama. The crowds who appear outside with the discovery of the body of the love child in the lake, scramble over the forbidding rocks in this desolate landscape. Staging, costumes and lighting all contribute to the sense of desolation which permeates this drama. Slightly updated - wind turbine towers are in the background and a cheap TV is on the table - the small town claustrophobia of 19th Century Moravia can be easily understood by contemporary audiences. Bachler was generous with the assembled talent to bring this off. The blazing work of soprano Eva-Maria Westbroek has generated much press recently and, in the title role, her desperate love for a feckless young man, Steva, could not be more heart-wrenching. With one of the most passionate and generous voices today, her anguish was palpable throughout the hall. There was a sure chemistry between her and her step-sister, Kostenicka, played to perfection by the veteran soprano Deborah Polaski. Canadian Joseph Kaiser, with a clear, expressive tenor, was convincing as young Steva and Stefan Margita added his disturbing, complex reading of faithful Laca. The secondary characters were also theatrically on target, including opera legend Helga Dernesch, now 70, as the grandmother. This was also a fine day for Kirill Petrenko who lead the distinguished opera orchestra with vivid clarity. His career is taking off in the last few years with major appearances in the pit at New York, Paris, Vienna and London and his galvanizing leadership contributed to the seamless night of high-voltage music making. The opera is playing now at the Bavarian State Opera’s National Theater through April 27 and will be seen again as part of the Munich Opera Festival on July 9. Information is at http://www.bayerische.staatsoper.de/. When I last visited LA (2002), just before the opening of Frank Gehry’s Walt Disney Concert Hall - the new home of the Los Angeles Philharmonic - I was not impressed with the exterior of the building. I did not stay long enough to see or hear the interior. This year, in LA again on my way back from China, I was in the hall on the occasion of one of Esa-Pekka Salonen’s last concerts as music director (April 9, 2009). The evening began with a short film celebrating Salonen’s seventeen years with the orchestra. This is the longest tenure of any LA Phil music director and Salonen today is a beloved figure in the community. 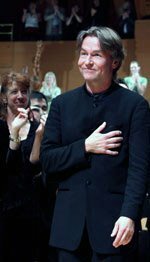 Salonen has always peppered his programs with new works and collaborated with some of the most interesting artists in other fields including director Peter Sellars, and video artist Bill Viola. While other orchestras have got mired in the past and have had trouble reaching out to younger audiences, under Salonen’s leadership the LA Phil has been a trend-setter. His promotion of contemporary music, his exceptional conducting skills and his energy have made the LA Phil a uniquely modern orchestra. The first piece of music on the program was Ligeti’s Clocks and Clouds, which dates from 1972 and was inspired by the work of philosopher Karl Popper. Strangely hypnotic, the composition makes highly original use of five clarinets and a twelve-voiced women’s chorus. The ladies of the Los Angeles Master Chorale make a remarkable contribution. 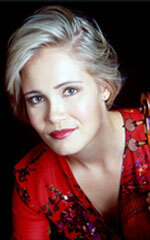 Following Ligeti was the premiere of Salonen’s Violin Concerto. Judging by this work, Esa-Pekka Salonen is a multi-faceted, profoundly interesting man. The piece draws on quasi-experimental avant-garde techniques, but clearly has roots in the recent past- Stravinsky and Berg are evident influences - and takes pleasure in contemporary pop music too. Soloist Leila Josefowicz (photo: right) performed this fearsomely complex new work from memory, playing with authority and passion. Beethoven Blazing with Intensity and Forward Motion!Esa-Pekka Salonen is not known for his Beethoven, but he clearly has strong ideas about how the piece should go. He is very much a modern musician, well aware of what the period instrument specialists have taught us about this music and how it should sound. Following suit, Salonen had his timpanist use harder sticks, his strings less vibrato, his trumpets rotary-valved instruments, etc. He is also current in believing that early 20th century performances with modern instruments have generally used far too many strings and failed to take seriously Beethoven’s metronome markings, and that these two issues, in fact, go hand in hand. For this performance, Salonen cut his cellos back to eight and his basses back to six. Curiously, he used a seating pattern more common with conductors of a previous generation – Toscanini and Klemperer come to mind. Basses were on the left, with cellos behind the first violins. Second violins were to the conductor’s right on the outside. All this scholarly preparatory work is irrelevant, however, if the performance falls short. This Beethoven 5th was blazing in its intensity from beginning to end and Salonen's musicians played with every ounce of energy they could muster, especially the timpanist. His tempos could seem unyielding at times, but the relentless forward motion had its own rewards. I am sure the double basses would have liked a little less of it in the trio section of the scherzo – the tempo was so fast they could only approximate the actual notes – but who could complain in a performance this exciting. On the podium, the conductor Salonen most resembles, in my opinion, is the late Herbert von Karajan. Like Karajan, Salonen is very still except for his arms, and his more extroverted movements clearly grow out of the music rather than being simply showy or exhibitionistic. He is very sparing in his cues but there is no question about his mastery of the music. Again like Karajan, this economy of movement and air of authority has the effect of focusing the attention of both musicians and audiences. Salonen to Spend More Time Composing? 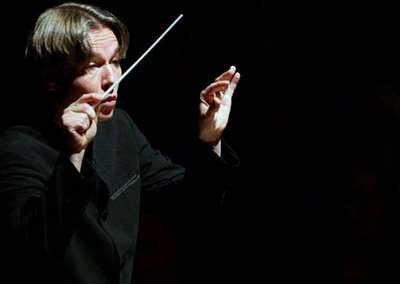 If Salonen has changed the music scene in LA, the city and its unique culture have changed him too. He was an introverted young Finn when he arrived, preferring to let his baton do the talking. He is older and more mature now, but also far more outgoing and not shy about expressing his opinions. He himself acknowledges that he discovered himself through living in LA and working with the orchestra. As he nears the end of his historic tenure in Los Angeles, Salonen is a musician at the very top of his game. In the next few years he will spend at least part of his time in London as principal conductor of the Philharmonia Orchestra. In recent interviews, he has said that he will also devote more time to composing. If this is so, we look forward to hearing these new works. In his compositions over the past fifteen years, one can hear a steady evolution toward ever more ambitious and successful works. Salonen is unquestionably an important composer. At the same time, he is one of the most gifted and imaginative conductors of his generation. Few maestros combine the technical command, the breadth of repertoire, the charisma and the imagination that define Salonen. But time marches on. Dudamel is waiting in the wings in LA and will doubtless bring something new and vital of his own to the orchestra. The Ultimate Measure of a Hall is the MusicThe Walt Disney Concert Hall, the home of the Los Angeles Philharmonic, is, in my opinion, commendably daring architecturally, but neither beautiful nor practical. The entrance seems to have been dealt with as an afterthought, or a necessary evil; to put it another way, it is so small and inconsequential as to seem apologetic, rather than inviting as it should be. Once inside, that impression of ‘unfriendliness’ is reinforced by dark and cramped lobbies. The search for one’s seat can be a nightmare. Everything looks the same as one wanders from level to level, down nameless corridors, leading to who knows where. Had architect Frank Gehry decided that clear and prominent signage was unfashionable? An usher appears. I offer up my incomprehensible ticket for guidance. She deciphers the secret code and motions me down another corridor. At intermisssion, I somehow find my way to the refreshment area – no signs, of course. I expect to hear the usual bell, warning that intermission is coming to an end, but no such bell sounds. Instead, ushers clambering up and down the various levels begin shouting that the second half of the concert is about to begin. Is this too one of Gehry’s bizarre innovations? Personally, I prefer a persistent bell to official bellowing. I was reminded of the soldiers I had seen a few weeks earlier, stationed in Tiananmen Square to manage the tourists; when people weren’t moving fast enough, they shouted menacingly, herding them along. Like most other patrons, however, I am prepared to forgive most, if not all, of the nuisances heretofore mentioned, if the concert hall has wonderful acoustics; on the basis of what I heard in one concert by the LA Philharmonic in this hall, I must enthusiastically say: ‘All is forgiven’! In spite of its shortcomings, the Walt Disney Concert Hall is a great place to listen to music. Acoustician for The Walt Disney Concert Hall (photo:right) was Yasuhisa Toyota, who also worked on Suntory Hall in Tokyo. Although he clearly deserves a lot of credit for the excellent sound in this hall, I looked in vain for his name on the LA Philharmonic website. Kendall’s Brasserie and BarIf you want a good meal before a concert, I suggest you avoid the two options inside the building and go across the street to the former home of the LA Philharmonic, the Dorothy Chandler Pavilion. Kendall’s Brasserie and Bar has excellent food, good service and a warm and friendly atmosphere. On a nice evening you can even sit outside and enjoy your meal. Paul E. Robinson is the author of Herbert von Karajan: the Maestro as Superstar and Sir Georg Solti: his Life and Music, both available at http://www.amazon.com/.